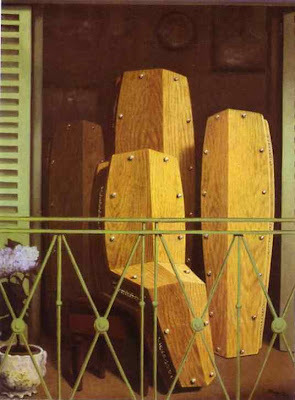 I always got a kick out of the paintings of Belgian surrealist Rene Magritte (1898-1967). I was looking over my Mom's shoulder today at a furniture catalog she was perusing and saw some styles of what I like to call "fainting couches." They immediately reminded me of Magritte's portrait of Madame Recamier (top), which parodies an unfinished portrait from 1800 by Jacques-Louis David (1748-1825). 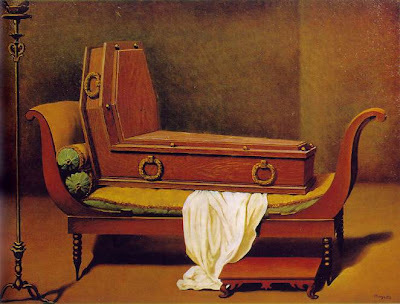 But to my delight, I have found that she was not the only subject to be depicted as a coffin by Magritte. 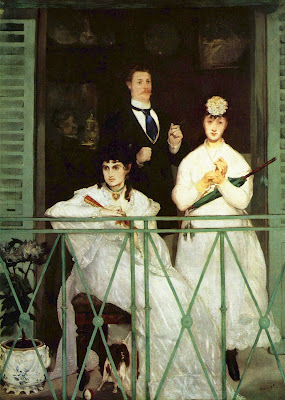 Above are two similar paintings from a series called "Perspective" and the originals which they parodied: "Portrait of Madame Recamier," 1802 by Francois Gerard (1770-1837) and "The Balcony," c. 1868-1869 by Edouard Manet (1832-1883). 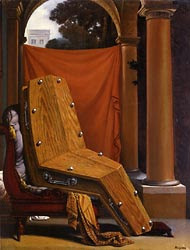 Ironically, it is David's painting that springs to mind first, though the painter left it unfinished when he found out Gerard was painting the same subject. 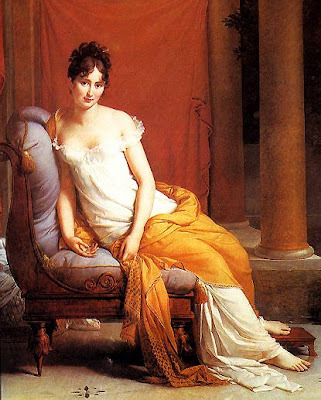 The surname of the woman in question, Jeanne-Francoise Julie Adelaide Recamier* (1777-1849), has become synonymous with the couch upon which she sat. *Unfortunately, the new version of Internet Explorer that I downloaded no longer allows me to copy diacritics to my posts, so please excuse the lack of accents in the French names.